White Dead-nettle, Lamium album has toothed, heart-shaped leaves that look very similar to the leaves of Stinging Nettle, Urtica dioica, a plant which is familiar to many. White Dead-nettles and Stinging Nettles also share other charcteristics such as having leaves arranged in alternate, opposite pairs on a stem with a square-shaped cross-section. 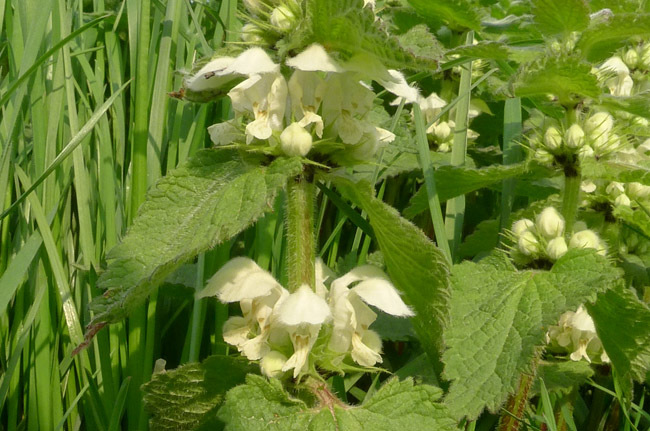 Both plants are also hairy but, as suggested by its name, White Dead-nettle does not sting. White Dead-nettle, Lamium album, has a leaf shape similar to Stinging Nettle, Urtica dioica. Photo: Paul Kirtley. Despite the similarities maybe leading you to think otherwise, Dead-nettles and Stinging Nettles are not in the same family of plants. 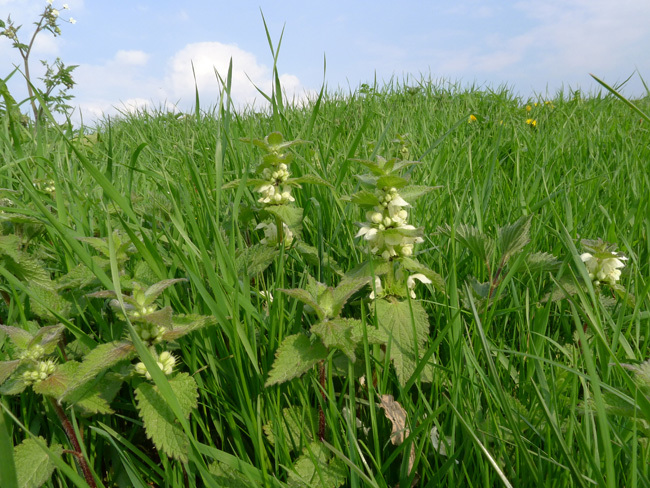 Dead-Nettles are in the family Lamiaceae, which also contains familiar herbs such as Mint, Basil, Thyme and Marjoram. 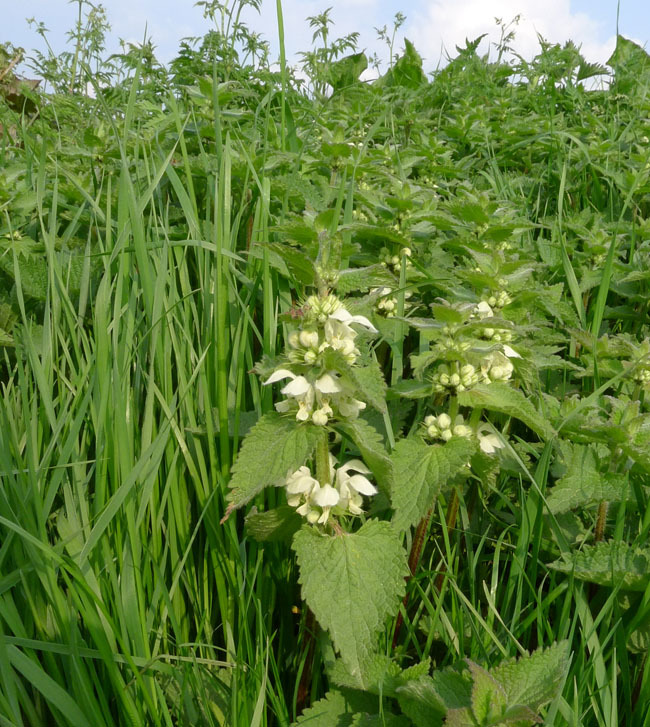 White Dead-nettles grow to a height of 20-60cm and have distinctinve white flowers that cluster around the plant’s stem. They are generally found growing on waysides and on hedgebanks. A close-up of the distinctive clustered white flowers of White Dead-nettle, Lamium album. Photo: Paul Kirtley. 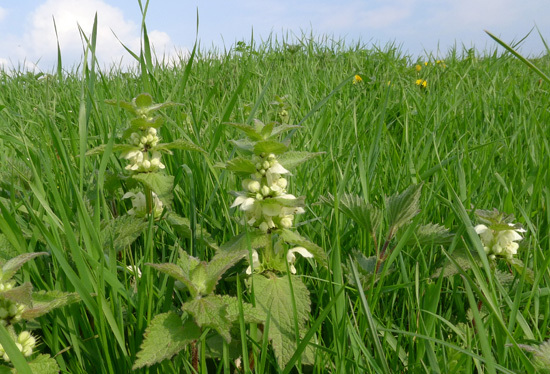 Even though White Dead-nettle is not an aromatic herb like some of its other family members, it is edible. Before the plant flowers, the young leaves and shoots are tender enough to eat raw. Later, when the leaves become tougher and possibly bitter, you can steam or lightly cook the leaves and eat as a green. Or you can add the leaves to soups as you would the leaves of Stinging Nettle. I’m going to be on the look out for these, it’s a plant I was completely unaware of. I’m sure there will be lots around your neck of the woods. Very handy article once more Paul. Thank you again. You’re very welcome Kirkland. Thanks for the feedback. I remember as a child, picking off the flowers and then brandishing the deflowered dead-nettle as a demonstration of my super ability to resist pain to my school mates. They soon cottoned on though. It’s good to know of more practical uses for the white dead-nettle too. Thank you. Paul, does the common stinging nettle not have flowers? If not then I always thought the dead nettles were stinging nettles.